François D'Haene smashed the previous supported FKT by over 12 hours, running the route northbound in 2d19h26m (2d16h31m from Whitney summit), Oct. 14-17, 2017. D'Haene is the first person to complete the route under 3 days. The 31-year-old Frenchman is 2-time winner (including 2017) of the Ultra Tour du Mont Blanc, the most prestigous and competitive 100 mile trail race in the World. His approach was unusual in that by choosing to run in mid-October he gave up daylight in exchange for cooler temperatures and easier access to hiking permits for the area. He also had pacers for the entire distances, probably a first. D'Haene carried a satellite tracker and his trip was followed carefully to ensure that he stuck to the official route. An early article on his accomplishment, with a few photos from his InstaGram was published by outsideonline.com. 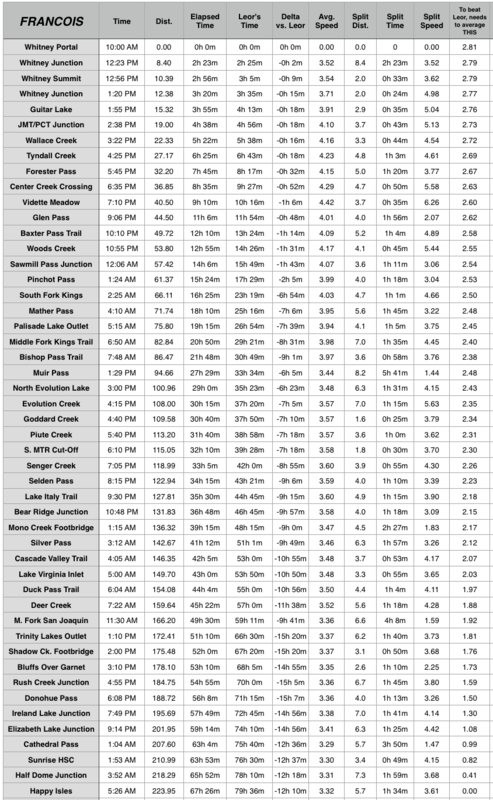 A detailed spreadsheet of D'Haene's splits, and comparison with the previous FKT by Leor Pantilat, is below, taken from this thread on backpackinglight.com (thanks to Adam White).